Full casting has been announced for Christopher Wheeldon’s stunning reinvention of An American in Paris. Directly following celebrated engagements in Paris and New York, this critically acclaimed and multi-award winning new musical bursts into life in the West End from Saturday 4 March with the official opening night on Tuesday 21 March at the Dominion Theatre. Joining the previously announced Robert Fairchild (as Jerry Mulligan) and Leanne Cope (as Lise Dassin) will be Jane Asher as Madame Baurel, Haydn Oakley as Henri Baurel, Zoe Rainey as Milo Davenport and David Seadon-Young as Adam Hochberg. Ashley Day will be the alternate Jerry Mulligan (and will assume the role from Monday 19 June). The company also features Julian Forsyth and Ashley Andrews, Sophie Apollonia, Zoe Arshamian, Sarah Bakker, James Barton, Alicia Beck, Chrissy Brooke, James Butcher, Jonathan Caguioa, Jennifer Davison, Katie Deacon, Rebecca Fennelly, Sebastian Goffin, Alyn Hawke, Nicky Henshall, Genevieve Heron, Amy Hollins, Frankie Jenna, Justin-Lee Jones, Robin Kent, Kristen McGarrity, Julia J. Nagle, Daniela Norman, Aaron Smyth, Todd Talbot, Max Westwell, Jack Willcox, Carrie Willis, Stuart Winter and Liam Wrate. With music and lyrics by George Gerswin and Ira Gerswin and a new book by Craig Lucas, the new musical An American in Paris is directed and choreographed by Christopher Wheeldon, with set and costume designs by Bob Crowley; lighting by Natasha Katz; sound by Jon Weston and projection designs by 59 Productions. The musical score is adapted, arranged and supervised by Rob Fisher with orchestrations by Christopher Austin, dance arrangements by Sam Davis, musical supervision by Todd Ellison and additional orchestration by Don Sebesky and Bill Elliot. 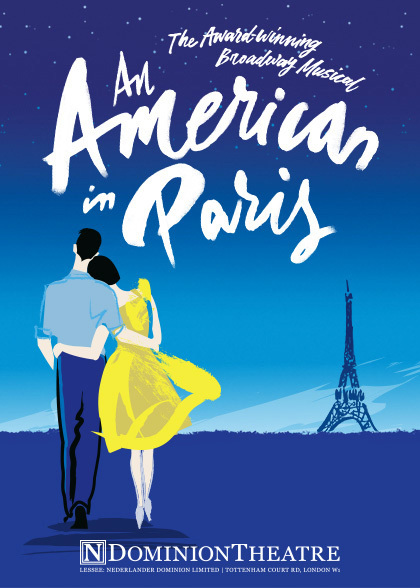 An American in Paris is produced in a London by Stuart Oken, Van Kaplan, Roy Furman, Michael McCabe and Joshua Andrews.